Welcome to our contact page! If you have an inquiry, this page is a great place to start. Use the contact form below to get in touch with us. Just like with our services, our goal is to be timely with our responses to inquiries, so we’ll get back to you shortly. We look forward to hearing from you! Looking for other ways to get in touch? 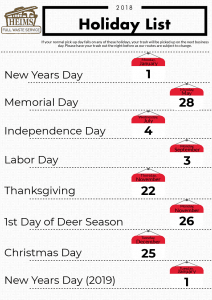 Looking for a list of Holiday Closures? Check it out below, or print it HERE.